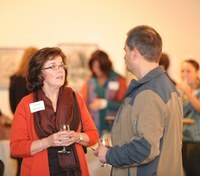 In addition to our services, we host a variety of events for nonprofit professionals. Whether you're looking to hone your presentation skills in a Mighty Mouth workshop or want to learn about search engine optimization (SEO) at a 501 Talks Tech training, we have professional development opportunities to fit your needs. We also host the ED Forum, which is designed to support peer networking and learning among nonprofit executives. Subscribe to our blog to keep up-to-date on all the latest events and news at 501 Commons as well as useful tips and insights. 501 Commons' events delve into an issue impacting nonprofits, provide a place to share great stories, and help you meet other nonprofit leaders and emerging leaders. New knowledge and inspiration await. Plus, a new contact may well become an important partner or life-long friend. Sign up for our e-newsletter and subscribe to our blog to receive event information and stay up-to-date. Executive Director Forums are a low-effort, low-cost, and high-impact way to gather with your executive director peers and learn from each other. Each forum gives you the chance to participate in three roundtable discussions led by an experienced executive director. Participants share problems and solutions and trade tips and resources. For more than a decade, ED Forum participants consistently report that they left with actionable information and an extra bounce in their step from networking with others in our sector. Email nancy@501commons.org if you are interested in being a discussion leader. Friday, June 7, 8:30 to 10:30 a.m.
Friday, December 6, 8:30 to 10:30 a.m.
Our King County Board Training Series runs from September to May, offering over a dozen well-reviewed sessions about governance and board development for staff and board members. Sessions are always held at Pacific Tower in Seattle but attendees from other counties are welcome! Cost is $45 per person and $40 for organizations that are 501 Commons members. Organizations with budgets under $1 million receive a $20 discount. Direct questions to Kendra Demuth at kendra@501commons.org. Technology is a crucial component for the success of nonprofits to serve their missions. 501 Talks Tech is a series of FREE monthly sessions that provide information on free and low-cost technology tools that are readily available to organizations of all sizes. Held periodically at Pacific Tower or online as a webinar, topics discussed at 501 Talks Tech include website maintenance, Google AdWords, social media, databases, search engine optimization, project management / collaboration tools, security & privacy, mobile, e-mail, and more. Affordable in-depth classes designed to build up your professional skills and leadership capabilities are available through the 501 Commons Staff Development Coalition. These workshops improve how staff and executive directors work with each other and the communities they serve. Sessions are 3-6 hours long and cover topics such as staff retention, diversity and inclusion, cultivating empathy and emotional intelligence, building leadership skills, improving communication, and handling difficult conversations. If you want to bring in a trainer for your staff, board or conference, contact us. We can deliver a wide range of board and staff trainings or conference presentations. Training topics include Board Leadership, Financial Management, Technology, Strategic Planning, Human Resources, Advocacy, and Volunteer Management. 501 Commons expert staff members are also available for retreats, conferences, coalition meetings, or events. 501 Commons and United Way of King County are producing a series of workshops that will help you improve your volunteer management practices. "The Life Cycle of Effective Volunteer Management" guides you through the critical components of setting a volunteer program up for success, while "Overcoming the Barriers to Family Volunteering" walks you through the process of engaging multi-generational volunteer teams. Overcoming the Barriers to Family Volunteering – May 3, 2:00 to 5:00 p.m., Pacific Tower (Room #810). The Life Cycle of Effective Volunteer Management – May 31, 9:00 a.m. to 5:00 p.m., Pacific Tower (Room #810). Specialists in the Nonprofit Resource Directory also offer learning and networking opportunities. Explore them here.